When pre-med student Jodi Scott joined forces with her sister Jen Scott, an herbalist, organic farmer, and midwife, and their mother, Kathy Scott, a designer, they found the perfect recipe for their natural first aid and wellness products—and for retail success. Together, the trio created Green Goo by Sierra Sage, a women-owned and family-operated brand focused on making sustainable and organic products across the health, beauty, baby, and pet categories. Read on to learn how this RangeMe Verified™ brand is making a positive impact while achieving retail success. When volunteering in the Philippines after a typhoon, Jen Scott saw firsthand how difficult it was to get medical care kits in remote areas, and she wanted to do something about it. 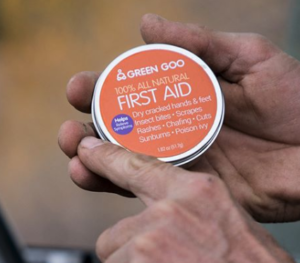 That life-changing experience was the impetus for the Green Goo team developing natural first aid salves and ointments out of their kitchen. The mother-daughter team initially distributed their products among friends and family and sold them at local farmers markets. And from there, they started receiving interest from retailers. “It was really a hobby gone wild,” Jodi Scott, now CEO and President of Marketing and Sales, says of their move to the retail space. Considering that the idea for Green Goo came about during a volunteer trip, it’s no surprise that the brand is dedicated to giving back. “We connect each product with an initiative that aligns with that product,” Scott explains of their charitable endeavors. For example, the mom and baby products give back to World Vision, a health initiative for mothers and children in Somalia. Scott ultimately hopes to connect every Green Goo product with a charitable organization. Green Goo is also a Certified B Corporation, or B Corp. “We’ve always been very passionate about sustainable practices and socially responsible business practices,” Scott says. Being a B Corp has allowed the brand to enhance its sustainability efforts and connect with other brands that align with their mission. Green Goo’s VP of Strategic Operations, Allison Adams, manages their RangeMe profile. As a former buyer, Adams understands the value of RangeMe and is very engaged with the platform. “The more interactive you are with the tool, we’ve found, the better results you’re going to get,” Scott says. 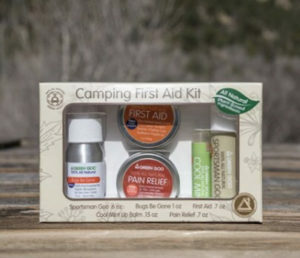 Green Goo has received interest from several retailers on RangeMe, including Albertsons. Their products were already stocked at Albertsons when the buyer reached out on RangeMe, but Scott believes that RangeMe helped them not only continue their success with Albertsons, but increase it. Looking ahead, Scott is excited to continue growing both the Green Goo product offering and the team. After a recent hiring wave, Green Goo now has 22 employees, and Scott is excited to continue bringing on seasoned team members to help take Green Goo to the next level. Scott is confident that Green Goo will continue its success as long as they are creating high-quality natural products, giving back to the community through charitable efforts, and using RangeMe to enhance their retail placements.